If you find yourself tilting to one side while you sit, due to the size of your wallet, it may be time to use technology to put your old friend on a diet. While I never had the pocket filing cabinet problem of poor old George Costanza, I did want to strip my wallet down to the bare minimum. I chose to do this not only for convenience, but also for security. The less important things that you are carrying around town, the less you have to worry about replacing in the event of a loss or theft. Also, a much slimmer wallet would allow me to switch to carrying it in my front pocket, for even more security. The first step was to determine the daily essentials, which for me boiled down to a driver’s license, a debit/credit card, a Costco membership card, and a bit of cash. I also carry a small, laminated piece of paper that I stuff behind my driver’s license which contains emergency contact information. Everything else in my old wallet was only rarely used, for reference only, or didn’t really require a physical card (like store discount cards where your phone number can be used instead). Your items may differ, but try to exclude anything that doesn’t require a physical item. I’ll discuss how to keep all of that other information nice and handy, a bit later. The next step was to locate the smallest possible wallet to contain the essentials. After much experimentation with various money clips (never really liked using them) and small credit card only wallets (folding cash to fit into these was too much of a bother), I tried the All-Ett Sport Wallet. These wallets are super slim, fairly sturdy, and can hold my chosen essentials with no problem. I tried the original version which is made of a lightweight nylon, but that was just a bit too flimsy for my taste. So, I settled on the leather version, which still has the nylon interior but is covered with a soft leather outer shell. It is a good compromise, same small size (just slightly thicker than the pure nylon version). 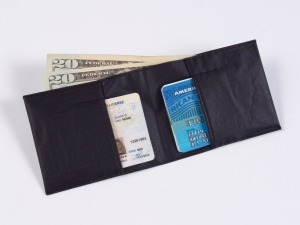 I like this wallet since you can easily fit your cards into the interior pockets and insert bills into the rear compartment without folding them. They have plenty of other models that should satisfy most every need. Now that the new wallet is in order, what do you do with the other bits of exiled information? You’ll need somewhere safe to stash them as well as readily accessible, so that rules out the junk drawer at home. I have been using Evernote as my external brain for quite some time, so it was the obvious choice. Evernote is a great way to capture all of the information that you don’t want or need to carry around in your head (or your wallet). It is a free web-based service (although I love it so much that I support it with a Premium account), with apps for most every device and computer, so storing and retrieving your information couldn’t be easier. If you haven’t checked Evernote out yet (or don’t know exactly what to use it for), this little wallet cleanup exercise is a perfect opportunity. With Evernote, I could scan all of the bits of paper kept for reference and cards that rarely get used (like prescription or insurance cards). 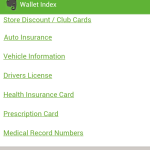 All of those store discount / rewards cards can also be scanned into Evernote, pulling up a scanned card on your phone (more on that later) should allow the checkout clerk to scan your barcode. Although, I find that this usually takes longer than just typing in the associated phone number for that card, mainly because most clerks still look at you funny when you ask them to scan the picture on your phone. With all of my information stored in Evernote, I know needed an easy and expedient method for finding it all when I needed it. Having all of these separate bits of information stored in Evernote is great, but having to open up the Evernote app on my phone and search for something isn’t always quick (especially when you are holding up the check out line at the grocery store). 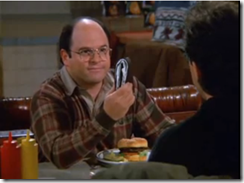 Since receiving my new phone, a Samsung Galaxy S III, I’ve been searching for new ways to utilize its cool features. One such feature is Near Field Communication (NFC). NFC allows two devices to communicate with each other when in close proximity. It also allows for a device to communicate with a stand-alone NFC chip, called a tag. You can program these tags to do a variety things: open a website, send a message, change some options on your phone, etc. One really interesting use of NFC tags is to tie physical objects to Evernote content. In order for this to work, the folks at Tapmynote.com have developed an Android app that allows you store links to a note in an NFC tag, and to launch Evernote and display that note when the tag is touched by your NFC device. This is awesome. So, I went out to TagStand.com and ordered the NFC Task Launcher Pack, which contained six NFC tags (four stickers and two plastic tags). I plan on using NFC Task Launcher (a free Android app) to automate some tasks on my phone later on, but the app isn’t required for this exercise. I also installed the Touchanote app on my phone. I already had the Evernote Android app installed, so if you are following along, you’ll have to install that as well. Now, I was ready to integrate all of these pieces into a useful solution. I stuck one of the NFC tags to the inside of my wallet (as soon in the photo). For this article the tag is visible, but I could have just as easily concealed the tag inside one of the credit card slots (it sticks rather well to the nylon material). If you do conceal the tag, be sure to test it first to see if your phone will read through whatever material is between it and your phone. For example, I could not read my tag through the outer leather shell of the wallet. To program the tag, you simply go into Evernote on your Android device, locate the note you wish to use, tap the share symbol, and share the note to the Touchanote app. The Touchanote app will launch and direct you to place your phone on top of the NFC tag to program it. Voila! You’re done. The next time you place your phone on the NFC tag, Evernote will launch and open the specific note that you programmed into the tag. 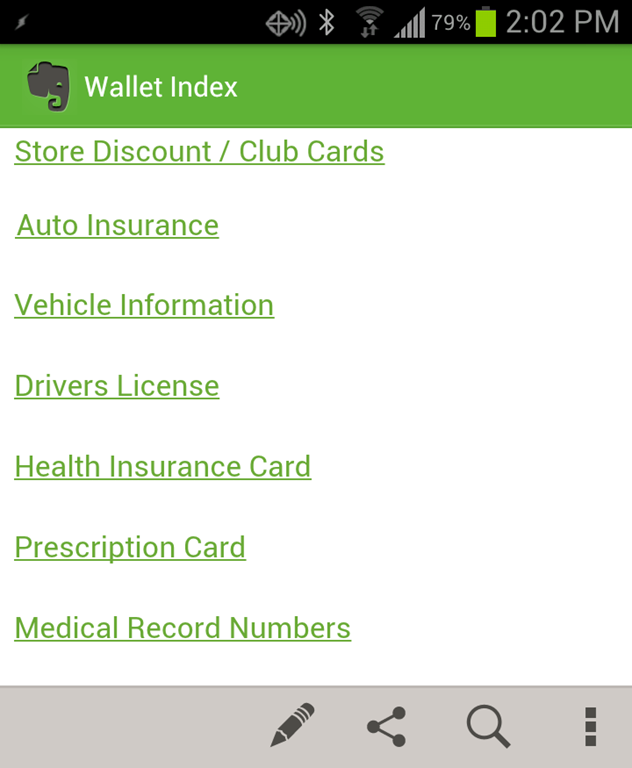 Now, when I am out with my new slimmed down wallet but need to retrieve some arcane bit of information in a hurry, I simply touch my phone to my wallet and Evernote + NFC serves it up. The Touchanote app only links a single Evernote entry to an NFC tag. 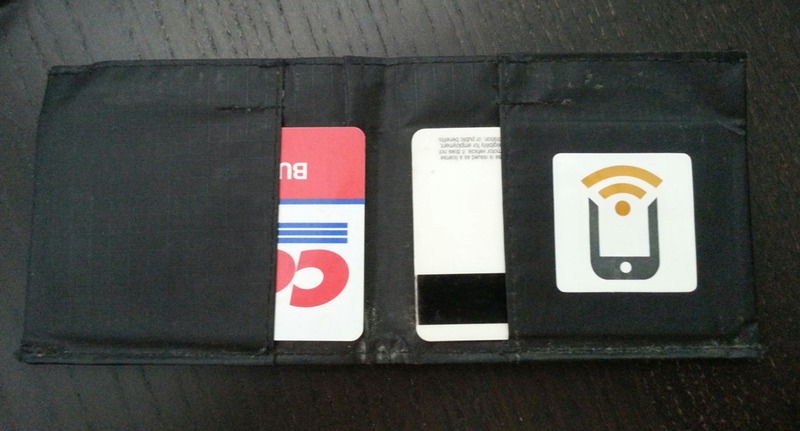 Although you could plaster your wallet with multiple NFC tags, it really isn’t practical. Since I did not store all of my information into a single note, I created a new note that would be linked to the NFC tag in my wallet. I called this note “Wallet Index” and filled it with Note Links to all of the information that I wanted tied to my wallet. Note Links are a really cool Evernote feature, learn more about them here:Evernote Blog. Use Evernote’s encryption options to keep some information safe, just in case you lose your wallet and phone. I typically encrypt selected sensitive portions of notes using the “Encrypt Selected Text…” feature (see here for help). If you enable Evernote’s offline capabilities you will be able to store some of your information locally on your phone for those times when you may not have internet access (see here for help).